It didn't start the way it ended. Bowling Green lost seven of its first 12 games -- at one point dropping six straight, including a four-game sweep at South Bend. But that was the last time the Hot Rods would lose more than three in a row all season. The Class A affiliate of the Tampa Bay Rays finished 90-49 to clinch its division in both halves and lead the Minor Leagues in regular-season victories before plowing through the playoffs to win the Midwest League Championship. With that remarkable campaign, the Hot Rods sped to a 2018 MiLBY Award for Best Team, winning the staff vote. "When you have great players like we had, it's a credit to your amateur scouting and your international scouting and your pro scouting," Bowling Green manager Craig Albernaz said. "They got us a group that was great to work with and versatile." That group included players who led the league in RBIs and doubles (Moises Gomez, 82, 34), finished second in batting average and fifth in stolen bases (Vidal Brujan, .313, 43) and tied for the league lead in wins and was second in ERA (Tommy Romero, 11, 2.95). But whatever results jump out, this wasn't a team of superstars focused on individual stats. The Hot Rods caught fire in the season's second month, putting together a 10-game winning streak while taking four consecutive series -- and it was their cohesion that made it work. "Guys took ownership of that. Any time we had a runner on, from May [through the rest of the season], I had a good feeling the job was going to get done. … They made it a little easier for the next guy. They bought in, and it was just easier to be competitive in games." But as with most Minor League teams, the things that seemed most exciting about the squad that broke camp out of Spring Training were not the same things that factored heavily into the season overall. For the Hot Rods, all eyes were on just one player at the start of the year. "Once we broke Spring Training, [Brendan McKay] was the headliner. He was only there for a month, if that," Albernaz said. The two-way phenom and fourth overall pick of the 2017 Draft did live up to the hype -- so well, in fact, that he was bumped to Class A Advanced Charlotte on May 11 after improving his Midwest League on-base percentage to .484, one day after punching out seven over six innings of one-hit ball to lower his ERA to 1.09 in six starts. As impressive as he was, the Hot Rods staff was excited to see which of the other arms would step into the spotlight after McKay's promotion. "Everyone was talking about McKay, but we knew as a staff the level of talent we had," Albernaz said. "At this level, it's all about when that talent is going to show up, or if it's going to show up. You don't know. It could be now or two years from now, so it was good to see them perform this year on the pitching side. Obviously, Romero and [Tobias Myers] had great years, but we also got great outings from [players who moved on like] Josh Fleming, Riley O'Brien, Jose Disla, Phoenix Sanders, Hunter Schryver…." Myers joined Romero on league leaderboards, finishing sixth with a 3.71 ERA while going 10-6 with 101 strikeouts and 41 walks over 23 games -- 21 starts. Fleming, O'Brian, Disla and Sanders were all promoted to Charlotte, and Schryver was sent to the White Sox at the trade deadline for future considerations, but none of them left the Midwest League with an ERA greater than 3.02 (Fleming's was 1.20 through 10 starts). "We thought pitching was going to be our strength, hands down. That was exciting and fun," Albernaz said. "We had a ton of arms. It was a credit to our scouting -- when we lost guys, we could bring guys up. Paul Campbell came from Hudson Valley and he was not well known out of college, but he was outstanding for us. And Brian Reith, our pitching coach, [deserves] a ton of credit, too." It was thanks in part to Reith that -- although the pitching staff had as much of a revolving door as staffs in the Minors do -- the results stayed consistent from May on, with the Hot Rods winning seven series that month and six in June. "I wouldn't say there was any one thing that clicked. It was just timely hits and the pitching settled in. ... Pitching is always going to be ahead of hitting in this game. So once the pitching settled in, it was like, 'OK, that's where the pitching's going to be,' and you kind of relaxed a little bit. It made everything easier," Albernaz said. "In terms of position players, you don't know when those stretches are going happen. A guy can get hot anytime then go cold -- especially these guys in their first long season." Along with Gomez and Brujan, outfielder Carl Chester (.285/.328/.412, 23 doubles, 15 steals), first baseman Devin Davis (.284/.349/.386, 17 doubles) and others made sure the team scored runs even if somebody fell into a small funk. No individual slump was prolonged enough or deep enough to keep the team from posting a league-leading .274 batting average, tallying a league-best 636 RBIs or scoring a second-best 718 runs. Not that the Bowling Green group was thinking much about those numbers while it was compiling them. "We're so focused on -- in the Minor Leagues and with the Rays -- developing big leaguers, on helping these guys develop into championship-caliber big leaguers, it's like we get tunnel vision on working with them that way, focusing on making sure they're getting reps, developing how they need to develop, grinding all through practices," Albernaz said. "By the time the game starts, it's like, 'This is the fun part.' And when the games started and they went out to play, that was fun to watch. It really was." By the time the playoffs rolled around, Bowling Green was 10.5 games ahead of Lansing in the overall standings. Facing the Lugnuts in the best-of-3 first round, the Hot Rods swept their way into the semis, where they dispatched the West Michigan Whitecaps with two more wins. "[The atmosphere in the postseason] was fun, to be honest. I told the guys before the first game of series, 'The hard part is over. Playing 140 games is the hard part. The hard part is that grind. Now you get the fruits of your labor. All that hard work paid off and you get to compete and be in the tournament,'" Albernaz remembered. "No one tried to do too much; they just did what they'd done all year. The first game we won, we won on pure baserunning. Jim Haley scored from second on a sacrifice fly and Taylor Walls scored from second on an infield single to the shortstop." Before the opener of the best-of-5 Championship Series, the Hot Rods got more good news: Brujan had been selected first overall in the Dominican Winter League's rookie draft, going to the Toros del Este. "It was so fun to see that extreme jubilation from the whole team, to see a guy who'd worked himself into a $15,000 signing slot," Albernaz said. "That was a highlight, too, that great team moment." 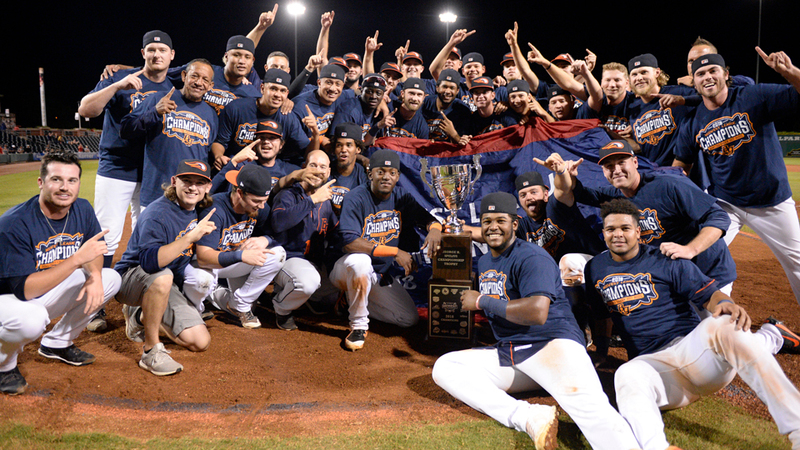 Spirits remained high as the Hot Rods put away the Peoria Chiefs in four games, bringing the Bowling Green franchise its first-ever title in a banner year for the Rays organization. "We have great fans," Albernaz said. "The season-ticket holders, the boosters club, they were great with our guys, especially our Latin kids. And [general manager] Eric [Leach] and the front office were great, too, so to bring it home for them, that was awesome, especially for the first time. "People around the city were great to me and the staff and the guys all the time. To clinch at home was definitely a fun moment." At 87-30, the Phillies' Class A affiliate was the winningest team in the South Atlantic League and had the second best winning percentage (.630) among full-season Minors teams. The remarkable record was also the best in franchise history. They went 41-28 in the first half, then were even better in the second half, 46-23, to clinch the Northern Division title twice. After winning their first playoff game, the BlueClaws got a MiLBY-winning nine-inning no-hitter out of Spencer Howard to punch their ticket to the Finals and establish a franchise postseason first. It was fitting, in one sense, that their defining performance came on the mound. Lakewood posted a 2.74 team ERA -- the best among full-season Minor League teams and 55 points lower than that of Charleston, the second-best SAL staff. BlueClaws hurlers also threw a Minors-best 23 shutouts. Howard, naturally, was one of the workhorses all year; the second-rounder from last year's Draft made 23 starts and tied for the league lead with 147 strikeouts. David Parkinson, who went 8-1 with a 1.51 ERA over 17 starts for Lakewood before being promoted to Class A Advanced Clearwater, was named the Phillies' Minor League Pitcher of the Year. Will Stewart was 8-1 with a 2.06 ERA over 20 games for the BlueClaws, and he was one of six players the team sent to the All-Star Game, which he started. Kyle Dohy, a 2017 16th-rounder, was so dominant out of the bullpen (0.80 ERA, 63 strikeouts in 33 2/3 innings, seven saves in nine chances) that he forced a bump to Clearwater, too, and then to Double-A Reading. Zach Warren was second on the circuit with 15 saves. For 92 games, those arms could rely on Gold Glove-caliber work behind them -- literally. Second baseman Daniel Brito, who wrapped up the year with the Threshers, won the honor from Rawlings at season's end. With all that quality pitching and one of the Minors' best defensive middle infielders, the BlueClaws scarcely needed to put up any runs to be competitive. As it happened, they had the league's on-base percentage in Jake Scheiner (.372), who also finished second in batting average (.296), fourth in hits (134) and seventh in doubles (30) while stealing 10 bases and swatting 13 homers. Catcher Rodolfo Duran led the club with 18 roundtrippers in 88 games. Shortstop Nick Maton batted .256/.330/.404 with 39 extra-base hits. The best-of-5 Championship Series against Lexington started on the right note for Lakewood, which got back-to-back-to-back home runs from Duran, Jhailyn Ortiz and Maton, but the Legends won the next three. "What a year. What a year. What can I say?" BlueClaws manager Marty Malloy said after the Finals. "A week ago we had a nine-inning no-hitter. X amount of guys we sent to Clearwater and one went to Double-A, all the guys that played in the All-Star Game... What a good year."